What a busy summer it was for all of us! There was so many field, woodland and even house fires! 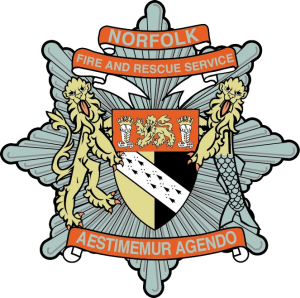 I was tipped to the Horsford fire as relief a little while ago and at first it was hard to locate where the fire was, but the heat all around was intense. I used the thermal imaging camera and was able to locate all of the different hot pockets (some as high as 300°c)! The fire was both a peat fire and a forest fire and was on such a large scale we had to section the area into 4 pieces and have teams firefighting in each area. We used the 70s connected to 45mm hoses. In past blogs I’ve told you about the hose reel jets, the hoses we used this time are much larger and can carry a higher quantity of water at just as high a pressure. It takes two people to operate from these hoses. One to control the branch and the other to provide support for the pressure of water which is released. This was the largest scale fire I have attended and I’ve been in the service for just over a year and a half! It was exciting for me but it devastated the area we were in. Please make sure you report a fire as quickly as you can so we can catch it before it spreads! I’ve also attended a few fires in the open which can range from out of control bonfires to field fires started through careless discarding of cigarettes. Although I absolutely love to get shouts, I would like to take the opportunity to remind you all that your actions can and do have an impact. Please remember firespread is so easy so stay safe, be careful with any type of flame and if you see a fire call us!